For use with VetGun™. 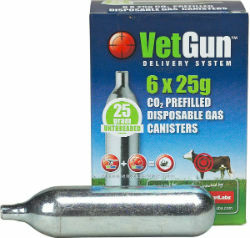 Each 25 gram CO² cartridge provides enough propellant for approximately 25 to 30 discharges of VetGun™. Each 90 gram CO² cartridge provides enough propellant for approximately 70 to 90 discharges of VetGun™.